Governments interest in aquaponics but also other advanced technologies like hydroponics or aquaculture is raising. That confirmed also interested in our consulting services for these areas last year. We have been providing our consulting services also on the czech market, where the aquaponics was a smaller part of a complex project to use efficiently the ground water. The project was combined with the energetic part and so we participated with EkoWATT the Center for Renewable Resources that won the project. Within the consulting services we are trying to understand the client’s situation and bring the best solution for them. That often includes clarifying the situation with the advanced technologies. We are meeting more frequently with the unrealistic ideas about the projects mainly in Aquaponics but also other production systems. The aquaponics still holds a sticker of a “perpetuum mobile” where you can combine a several kinds of plants and fish but it is a far from the truth. Aquaponics that combines hydroponics and aquaculture is logically more difficult because of there are 2 living organism, plants and fish, and so it needs more specialized equipment and know-how as you can see in Aquaponic scheme. 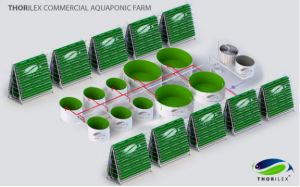 Commercial size aquaponics is can work but it is necessary to design and make the aquaponic farm very simple to reduce the risk and variable factors and this is probably the most common disillusion widespread around the word. The main idea of urban farming and incoming vertical farming is to produce food locally near the point of consumption and so support the newly forming urban farming culture. The current food system is inefficient and it has a significant burden on the environment. The food for the final consumer is transported from the farmers around the world. Use the space to produce food locally and effectively near the point of final consumption with THORILEX Hydroponic system. Aquaponics that combines hydroponics with aquaculture have plenty of reasons why it is chaning the traditional agriculture but we selected the TOP 10 reasons for you! Two in one. That is an aquaponic farm. You grow vegetables and breed fish. Then you can sell vegetables and fish meat, or utilize them yourself. You know how pests can destroy crops grown on field. But most pests are bound to soil. An aquaponic farm reduces risks of losing or damaging plants. Fish aren’t threatened by predators like in open water, so the numbers are stable. Plants in aquaponics grow up to five times faster than in soil. Your investment into an aquaponic farm will return really quickly. Vegetables from an aquaponic farm are naturally delicious and juicy. Fish are without smell, which is typical for breeding in the ponds. Your clients will appreciate this and will be going back for more. An aquaponic farm saves water. You’ll use up to 90 percent less water than with classical way of growing plants. There is no need to water the plants. You just have to refill water which vapors out or is consumed by plants. You’ll produce fresh fish and vegetables for all 365 days in a year. Also you aren’t dependent on seasons. Whether you sell your products or consume them yourself, you are contributing to healthier lifestyle of your customers. An aquaponic farm can grow many kinds of fruit and vegetables: e.g. strawberry, tomatoes, peppers, herbs and spices. In only a few tanks you can breed as many fish as in a big pond and as many crops as in a small field, without the need of fertile soil called “chernozem”. Demand for fresh vegetables and fish meat is rising. Sell meat, vegetables, herbs and spices. Profit and build your own successful business. Do you have a different opinion? Do you have other tips? Let us know and leave a comment. THORILEX is a testament to the evolution of food production. With a background in fishing and fish farming, the team came together in 2010 to bring aquaponic farming to the Czech Republic and then the world. Starting out as a consultancy firm, they soon developed into a more full-scale provider of services. By 2015, THORILEX, Ltd. was established as a designer and builder of turnkey fish farms, aquaponic and hydroponic farms. Having scaled their business from fish farming to aquaponics with a proprietary recirculating aquaculture system, they looked around at the market and saw a big opportunity in vertical farming. I spoke with Marek Hrstka, THORILEX’s Business and Marketing Director to discuss the company’s success and plans for scaling business in the future. 2018 was a year of progress for THORILEX, as they designed and delivered new patented (patent pending) products. The THORILEX Hydroponic System, a modern vertical farming system that is adjustable and scalable for commercial-scale growing, is now available on their website. They are also offering a long-life hydroponic basket that is compatible with their growing system, as well as a stainless steel, self-cleaning fish tank. THORILEX designs products with the “IKEA-model”: because they are designed to be highly modular, they can be easily packed, shipped and delivered with minimal costs. In this way, Mr. Hrstka says that THORILEX can bring these modern aquaponics innovations to markets across the world. Since last year, they have been busy implementing their hydroponic system in a pilot project in a 2ha glass greenhouse. This showcase farm allows them to produce food in a highly controlled environment, generating and collecting data to be made available in future case studies. We wish you calm and nice time during the Christmas time and thank you for the year 2018 and we wish you fruitful year 2019. In the new year you will find us in our new building which makes us happy. The building has been appropriately decorated with our THORILEX Sign from the outside. Whoever wants to see how it looks inside or in our THORILEX Aquaponic farm, he/she’ll have to make a trip to see us.